As writers, it’s easy to get in the habit of relying on words. These words are old friends we know well and they work for us. I know—when I search one of my manuscripts for over-used words, I find some favorites over and over and over. Yikes! It’s time to treat that well-worn word as a placeholder and find a better word. A quick fix some writers turn to is the thesaurus. This, however, poses a danger. A thesaurus brings many similar words together but doesn’t always depict the nuanced differences in these words. Here’s an example. 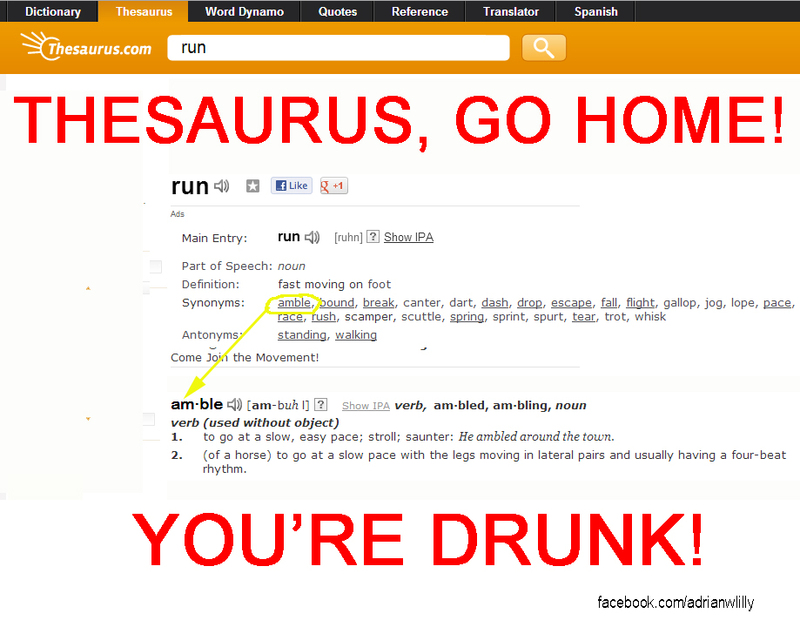 A thesaurus search on “run” yields quite a few results. But does “amble” mean the same thing as run? No. 1. to go at a slow, easy pace; stroll; saunter: He ambled around the town. Thesaurus – go home, you’re drunk! When looking for a better word, watch out for the gotcha thesaurus results – and look up every word you are not familiar with. As writers, it’s important to pay attention to the specific meaning of words to convey what we see in our heads. The thesaurus is a tool to help us—not a solution.